Since its origin, the railway station has had a complicated relationship with the city, demanding periodical updates, particularly regarding spatial issues. With the aim of improving the liveability of station areas, current redevelopment projects are reconceptualising them as balanced transport ‘nodes’ and ‘places’ in the city. However, the proposed spatial solutions do not fully support the sought after economic, social and environmental performances. These intentions continue to be predominantly bounded with the (abstract) planological level, not finding appropriate translation at the (concrete) spatial design level. Further, the interdisciplinary nature of the highly complex planning and design processes of station areas, which should contribute to enhance the performance of their spaces, reinforces constraints and relegates architecture to a marginal role in this quest. 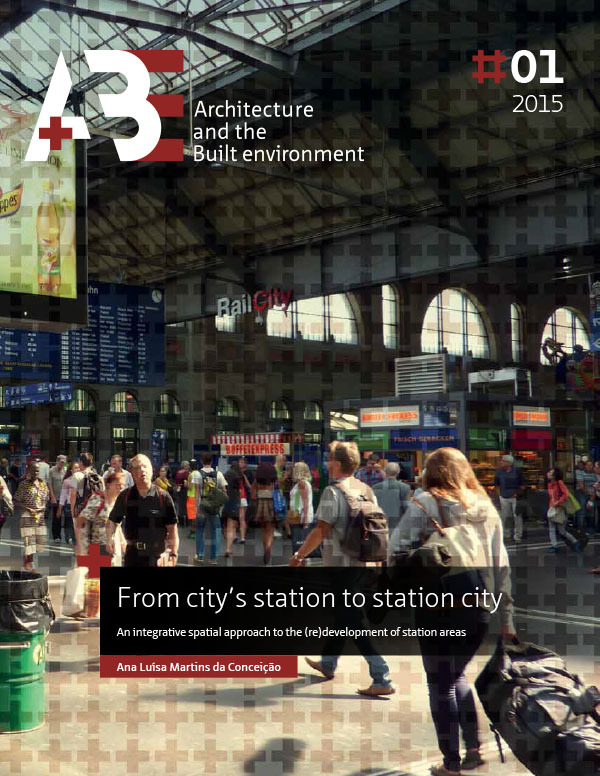 It is thus necessary to understand how architecture can contribute to the improvement of the spatial performance of contemporary stations areas, supporting their current reconceptualization. To gain this understanding, the research explored the factors which influence the spatial definition and performance of European High Speed Train station areas, using “design research” and “research by design”. Via a theoretical integrative framework, synthesized from knowledge developed by architecture and other sciences, case studies of ‘through’ stations were analysed and compared. Six cases, encapsulating the most recurrent relative positions of the railway (infrastructure and the station building) towards the(ir) direct built environment, were chosen out of a large sample. For each category (cases with railway tracks at (a) ground level, (b) elevated level and (c) underground level), two cases, featuring an adapted station building and a newly built one, were studied. Their physical and functional characteristics were mapped at several scales and moments (in history), as well as redesigned. A variety of positive and negative approaches and solutions to the problem were identified. The research is rounded up with a set of ‘design recommendations’ meant to improve the performance of station area spaces, based on the results of the (graphical) analyses and the redesign exercises. In general, to attain such performance the (physical and functional) integration of the public spaces of the station and of its surroundings, along with the specific (spatial) characteristics of the city they are located in, are crucial. The desirable concentration of transport and non-transport functions must be clearly organized in space, dismantling barriers to their accessibility. To operationalize such integration in all categories of cases, architecture must go beyond its traditional scope regarding intervention scale and methodology. This requires a structural change to the station area’s design task, which should be organized around spatial goals commonly subscribed by all stakeholders, and in which architecture should have a central role. Such renovated awareness on the approach to the redevelopment of station areas is necessary for the improvement of their spatial performance. In this way the ‘city’s station’ can become a ‘station city’ which enhances the city’s liveability, instead of draining it out.